I have been collaborating with Laurie Sagona, President of Sundance Marketing for the last 3 years. If you are interested in truly upping your game, contact Laurie Sagona immediately! The Van Bortel automotive group encompasses three brands in the Rochester area: Van Bortel Subaru, Van Bortel Ford and Van Bortel Chevrolet. For many years Van Bortel has focused the majority of their marketing dollars on print with the branded look being a use of white space, minimalist design and simple messaging punctuated with a signature image of Kitty Van Bortel. It is a clean, recognizable approach that has been a standout in the cluttered automotive advertising space. It has also by this very fact carried both an attitude and cache’ other automotive advertisers couldn’t duplicate without being copycats (pun intended). 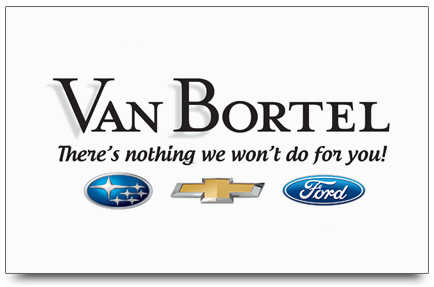 With the recent addition of the Chevy brand to the Van Bortel lineup of dealerships, the time came to cast the Van Bortel advertising net wider. Television is the natural medium for just such a move, and the television spots we produced provided the right kind of attitude, approach and clever messaging that rises above the clamor of traditional automotive advertising on TV. Likewise it compliments Van Bortel’s one-price philosophy through story telling that is memorable, catchy and very Kitty. We created seven new television ads, one for each of the three dealerships that were customer focused and delivered using animation and video. We also produced 4 ads that represented over all “Kitty philosophy” messages that drive her business every day. In addition, we updated the logos, produced radio commercials and print advertising that complemented the TV ads and messages. The Kitty Van Bortel who was known to the community at large mostly through her photo in the paper has “come alive” through her television ads. Her sincere love of the car business and of her desire for her customers to get the car vehicle they want at the lowest price possible shines through. This has resulted in increased recognition of the Van Bortel Brand and increased car sales across the board. “I have been collaborating with Laurie Sagona, President of Sundance Marketing for the last 3 years.